My life was put in to perspective this spring. As most of you know, my son was diagnosed with LCH, a very rare and serious disease. He had biopsy of his hip and a bone graph. He was in a wheelchair for nearly three months, used a walker for several weeks and then crutches. He had nerve damage, was admitted to the hospital, was in excruciating pain screaming out every few minutes even on Morphine and Neurontin, went through acupuncture, and missed the last two months of fourth grade and much more. Prior to this, I stressed over every little thing. I got worked up over little things at work, gossip, things friends were doing, small things at the house, dumb things the kids did, family drama, what to wear, etc. That all changed around April 23, the day we received Joey’s diagnosis. For weeks all I could think about is Joey and getting him better. I barely answered my phone because I didn’t care what was going on in the world outside of the issues my immediate family was dealing with. I actually avoided going to Kroger, Target and other public places. My BFF and mom would do my shopping. I didn’t want to run into anyone because I didn’t want to have to talk about what was going on with Joey and I didn’t want to hear about anything else in the world. If someone would bring up anything, outside of Joey’s condition, that would stress me out, I would immediately change the subject, leave the room or hang up the phone. I worried about Joey’s health and how my daughter Andi was going to handle it all non-stop. I must have said the Serenity Prayer: “God grant me the serenity to accept the things I cannot change, the courage to change the things I can and the wisdom to know the difference” at least 100 times a day for at least two months. I’m not exaggerating. That prayer and deep breaths is how I got through each day. I don’t think a day will ever go by again that Andi, Joey and I don’t think about LCHand how it has changed our lives forever but it has made us all worry less about other things. It really has put things in perspective for me. I find myself laughing at things I would once get upset about. I didn’t freak out when my daughter came home with a red streak in her hair that her grandmother had done without talking to me. I don’t get all worked up when someone sends an inappropriate email – I might make fun of it, but I don’t get upset. I don’t care if I hear gossip about myself. Even when talking politics, which has always been a hot spot for me, I find myself getting less worked up. I don’t care when that passive-aggressive acquaintance (we all have them in our lives) makes an indirect shot at me. I kind of find it funny and will probably call them out on it. In fact, this has made me even more out spoken than I once was but in a humorous way. Someone recently told me I was stuffy because I named my dog after I book. I laughed so hard – right there in front of the person. I just thought it was humorous and in no way felt any need to defend myself. I also find myself to be a little funnier than I was and joking around about most aspects of my life. I’m able to let go of stuff and I definitely don’t let material things worry me. I also don’t find myself complaining about life. Life is too valuable to complain. My son was diagnosed with a very serious disease. He couldn’t even get in and out of our house for a while. He will have scans for the rest of his life as we hope and pray the disease does not reactivate. Hug your children, laugh with them, don’t put too much pressure on them, don’t let silly work gossip or an insecure friend take up your time and pull you away from your kids, enjoy your family, dance around the room with them like no one is watching, have dinner together (even if it’s a PB&J on the way out the door), don’t put importance on material things, be silly and only worry about the things that actually matter in life – your family. 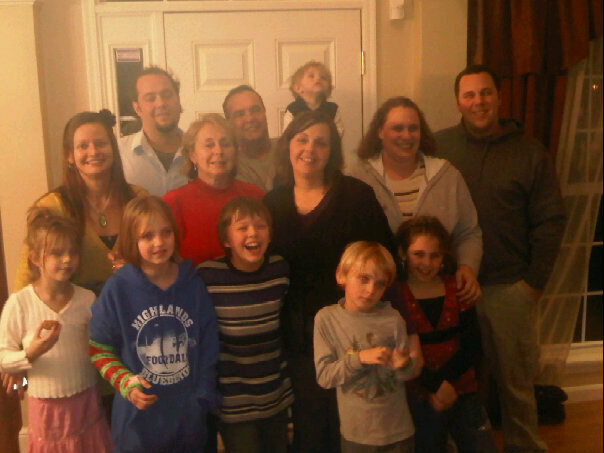 My brothers, parents, nieces, nephews, sister-in-laws and my children.